These days, I have lots of time for reflection. This really helps with my writing and new ideas are coming all the time. Today, I found myself with my bike at the bottom of the stairs leading up to the top of Parliament Hill. The pathway is blocked due to construction so it was either up or back the way I came. I never like going back so up I went, 286 stairs. The view looking up was a bit daunting, the view from the top was beautiful. I thought maybe this would work as a metaphor for how to deal with the risks one takes throughout life. Here, I am talking more about professional risks. Sometimes these risks leave you looking up wondering what went wrong and other times you can survey success from the top of the hill. What are some of the factors that determine success and failure? Sometimes I think it has everything to do with the people you find yourself working with. One project that I had been working on for the past few months collapsed entirely yesterday. I wrote about the venture here. The project had real potential, but I lacked partners who shared a similar view of the potential of this program. I do blame myself for this. I should have seen the signs – lacklustre response to the proposal, e-mails seldom returned, long bureaucratic notes on why certain things couldn’t happen – the list goes on. It’s a pretty standard list. Why didn’t I just cut and run, I have seen all these signs before – I have been in education systems for over 31 years! So, this is the bottom of the stairs looking up. These things happen, if you are not willing to take some risks you will never have the chance to get to the top of the stairs. You need to be at the bottom sometimes so you can savour the top! There is so much to celebrate when you do get to the top of the hill. I think as you gain experience you get a little bit better at finding projects that bring out the best in everyone involved. I put voicEd Radio in this category. It is so wonderful to work with people who encourage and empower you! My wife and I both work on a show for voicED and we have received nothing but enthusiastic encouragement from Stephen Hurley, the creator of this great project. Here a risk paid off. We had never done a radio show before, now we have a bunch of broadcasts – including a half-hour live show – that we did as part of an amazing full-day live broadcast featuring most of voicEd Radio’s regulars. My point is, you have to keep taking risks, even when your plans fall completely flat. Over time, the failures are no longer very important and you learn to move away and take whatever lessons you can. 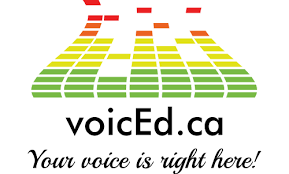 Then you find some real pearls like voicEd Radio where you meet great, positive educators and you take your learning to a whole new level. So keep climbing, don’t look back, move away from the negative nellies and get to the top of the hill! Happy to be climbing, and sometimes slipping, with you, Paul! So true about colleagues, support and encouragement. Hi Paul, still reading your posts. Sorry to hear about the El Salvador trip. But overall a great message about risks! It is hard to take risks, but the pay off is good. It helps to have a long-view of like, I think – not worried about this one failure and seeing it as The End, but as a step in the process. Sorry about your project. Hi Lisa. Thanks, no problem, always a good learning experience.